Not a banner week. Great reminder that no matter how smart we think we are we really don’t have control. 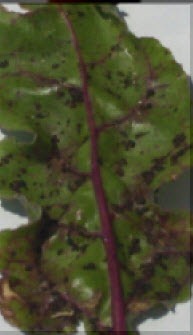 W ent out to get some beet greens for lunch on Monday. The first leaf I cut had funny black dirt all over it. Didn’t think much of it; figured it had drug in the dirt when we watered. Moved to the center of the plant and cut another leaf. Black stuff all over it. I gingerly touched “the dirt” – it was soft and squishy. YUCK!! Well, I learned something new this week. Who know that aphids come in black. My only up close and personal experience with aphids were the white ones on our roses and hibiscus plants. I also learned that aphids are also called plant lice . . which explains the squirmy crawly feeling I got!